We are pleased to share with you the first newsletter on the Minimum Standards for Mainstreaming Gender Equality. The newsletter includes updates on recent endorsements and tools to help you present the case for endorsing the Minimum Standards in your organization. In future newsletters we will be highlighting different organizations that are working to implement the Minimum Standards. We would love to hear from you about your experience! Feel free to email us your story, or tell us about it through the #GenderStandards hashtag! We are excited to have our first Gender Standards endorsers. 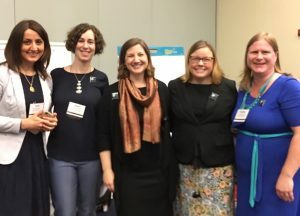 We welcome NCBA/CLUSA, the Heartland Alliance, and Oxfam America to the Gender Standards community, and thank them for their commitment to mainstreaming gender equality within their organizations! What Does It Mean To Be an Official Endorser of the Minimum Standards? The Minimum Standards for Mainstreaming Gender Equality are the result of a multi-organizational effort to endorse a set of practices and protocols that are the minimum bar for gender mainstreaming in international development and humanitarian aid programming. 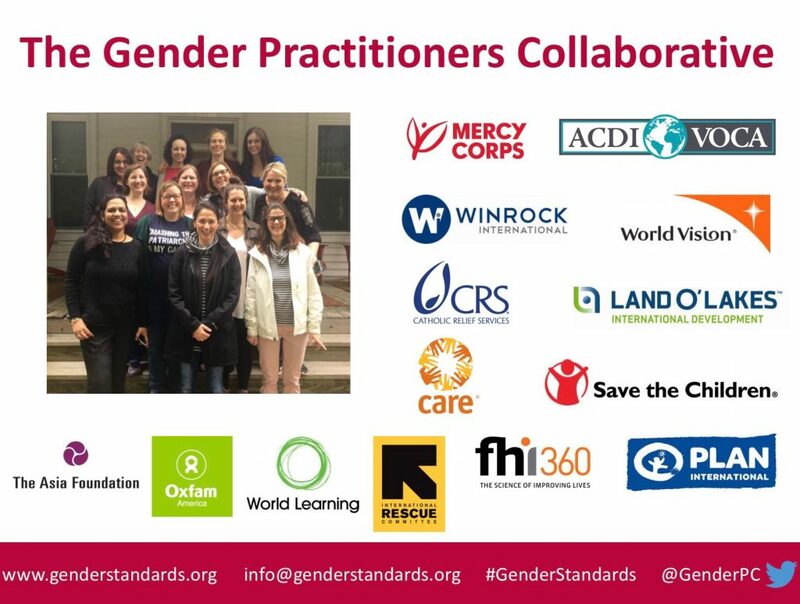 The Gender Practitioner’s Collaborative (GPC) – a consortium of gender experts representing 14 development and aid organizations – advises all donors, agencies, and organizations to review, endorse and execute the Minimum Standards for Mainstreaming Gender Equality in their international development and aid work. 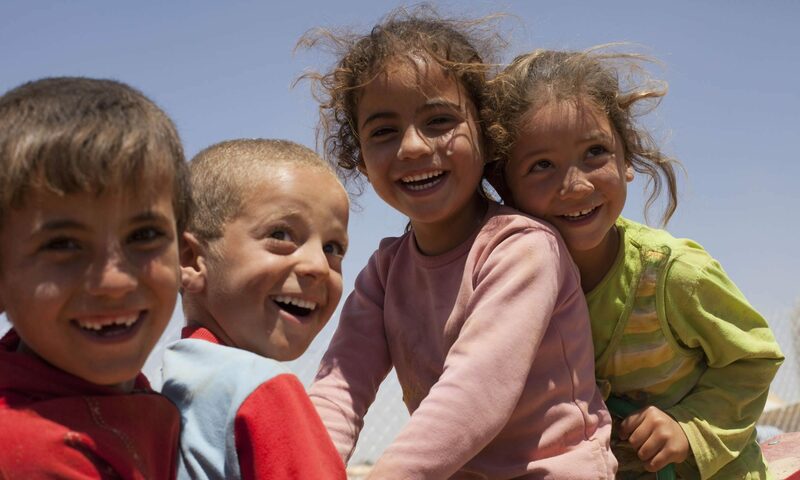 Agreeing that they are the best minimum practice for integrating gender equality within international development operations and programming. Agreeing to work towards implementing them at their own pace. Receiving approval from all appropriate organizational leadership to endorse them. Submitting an application to endorse the Gender Standards, which will be reviewed. Endorsing the Gender Standards does not necessarily mean an organization has already fully achieved them. Rather, it means the organization agrees that they are necessary and important, and will take concrete steps towards them. Each endorsing organization’s logo will appear online and in public materials on the Gender Standards. Commitment, adherence and reporting on the Gender Standards is entirely voluntary. The GPC will advertise the Gender Standards to a wide range of donors, agencies, and organizations to seek as many public commitments as possible. Accountability measures around the standards will be at the complete discretion of each organization. The aim here is to build buy-in towards aspirational commitments. Are you interested in reaching out to your organizational leadership to ask them to endorse the Gender Standards, but are not sure where to begin? Here are three resources that may be of help. 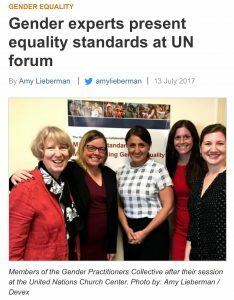 On April 19th, 2017, the GPC presented the Gender Standards to a broad group of interested allies at the US State Department, organized by the Office of Global Women’s Issues. Participants were very supportive of the standards and asked questions on how they could weave the standards into their work with practitioners. USAID requested that the GPC present the Gender Standards to their Gender Working Group on June 14, 2017. This included gender experts and champions across different bureaus at HQ and beyond. 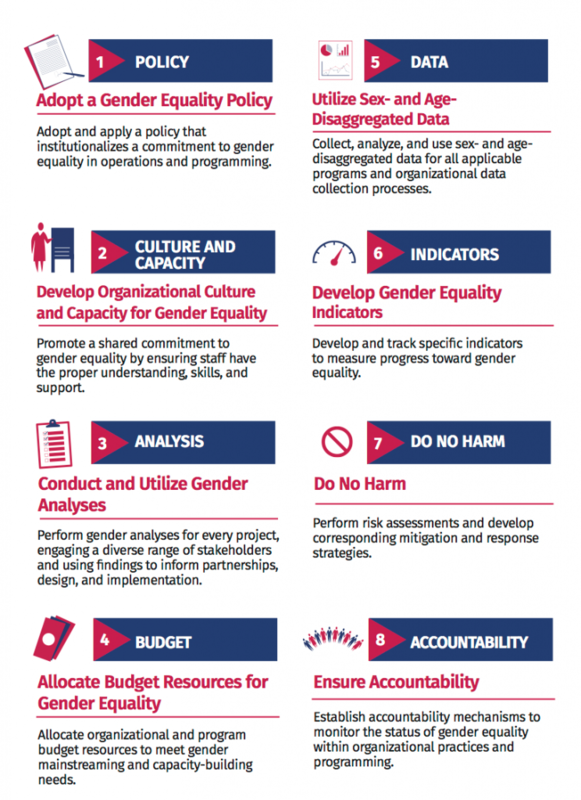 USAID affirmed the importance and timeliness of the Gender Standards, and asked questions about how they could go even further, and what systems of accountability could be put into place for those organizations that sign on as endorsers. GPC facilitated a lively game show style session at InterAction Forum 2017 to introduce the minimum standards, and give the audience the chance to engage with examples of what the standards look like in practice. One of these examples included gender audit, a practical tool for conducting organizational gender self-assessments. Sharing from World Vision’s experience, Yeva Avakyan spoke about this effective methodology in catalyzing organizational change on gender issues illustrating how organizations can take practical steps in achieving the minimum standards for gender mainstreaming. Our last stop was the UN High Level Political Forum, where we spoke about the Gender Standards as a means for strengthening organizational practices to achieve SDGs. See the story about our session highlighted on Devex. How wonderful to see the new organizations making the commitment to these important gender standards! Welcome to all, as we strive to put into practice the important steps to achieve gender equality in our development work. 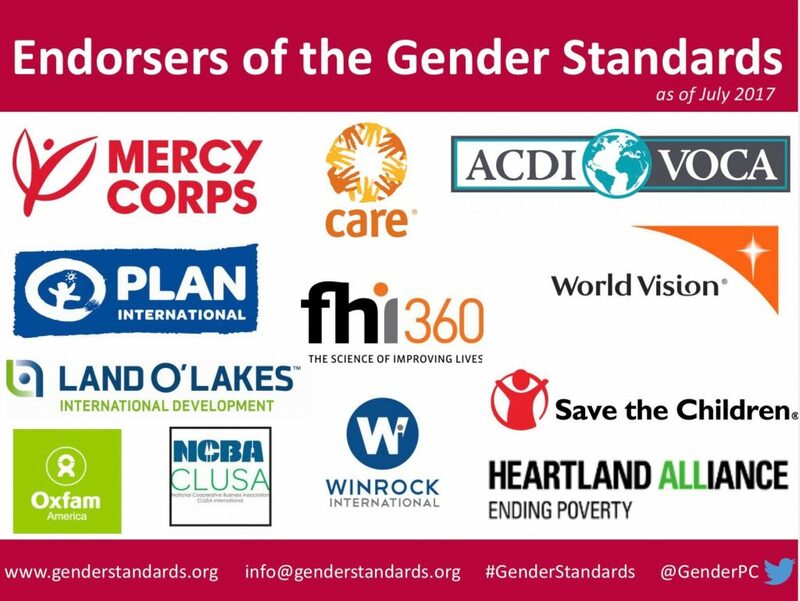 Congratulations to NCBACLUSA, Heartland Alliance and Oxfam America for joining us as endorsers of the Gender Standards!